The Allen Lab has using the Scrum method for 6 months. It is been remarkably productive. With two graduate students and three undergrads, we produced the data for two papers. One paper was submitted and provisionally accepted. The other is in preparation. We also produced a grant application. I give a lot of the credit for this to the Scrum method. I am new to lab management. My graduate students are very young and my undergraduates are just getting started. They have done amazingly and deserve the rest of the credit. I was not as productive in graduate school or in my postdoctoral work. I produced one paper per year (which is not bad) but this has been eye-opening. It’s actually very difficult not to try to “convert” people. I feel almost like Scrum is a religion or something. I keep thinking about promoting this to other people in the department. I really don’t think that’s appropriate, so I keep my mouth shut. I’m the new kid and I am not a management consultant by any means. Every lab is different. I recognize all of this. 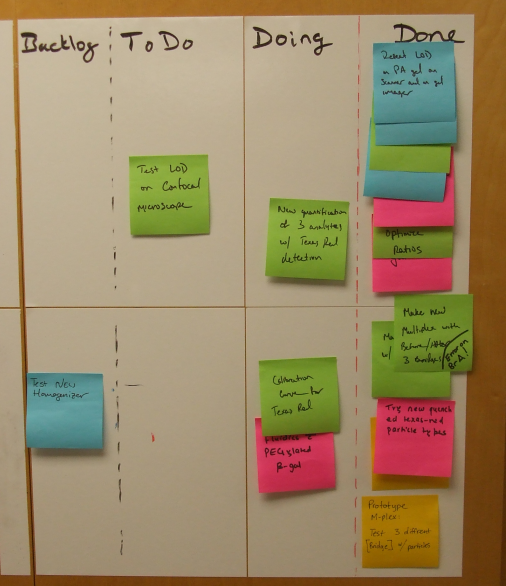 Even so, I rather wish that I had trained in Scrum when I was a graduate student. Maybe it would not have made much of a difference: there wasn’t a lot of “team science” when I was in graduate school. I don’t know if that’s a good thing or not. Maybe graduate students need more practice in team management. On the other hand, maybe it’s better to learn to do everything yourself. I don’t have a good answer for that, but I know what’s productive in my lab. This entry was posted in Leadership, Science and tagged Agile, management, productivity, Science, Scrum on August 4, 2015 by Peter.